We arrived in Phnom Penh after a 6 hour bus journey from Saigon. Relatively painless and hassle-free which was good. The bus station turned out to be walking distance from our hostel which was great, though didn't stop us from being followed by tuk tuk drivers. The hostel, International Guesthouse, was ok but realised soon enough the shower was cold, and again we had a sink which leaked everything onto the floor. All part and parcel with hostels in Asia we've found. We ventured out onto the main tourist street just on the riverfront and found ourselves a rooftop bar with views over the city. 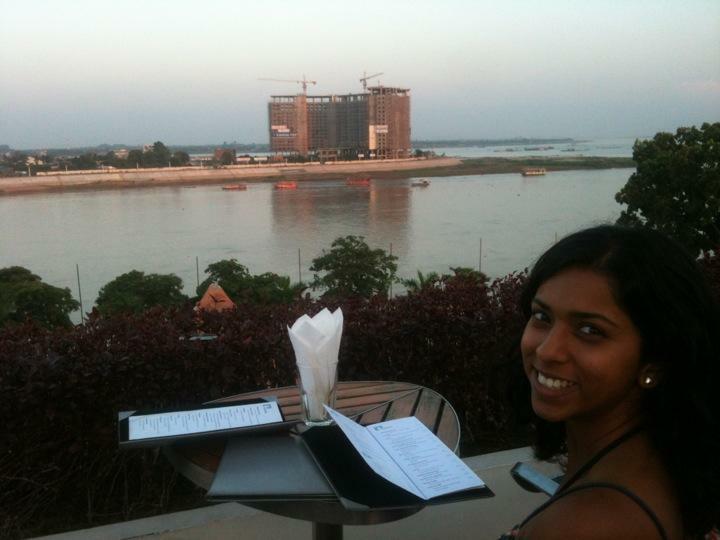 Now Phnom Penh I must say isn't the most beautiful city in the world, but still the view over the river and the rooftops was pretty good especially with some cocktails :P For our first taste of Khmer food, we decided to stop off at a Khmer restaurant and had the Lok Lak curry - pretty tasty curry, very similar to Vietnamese, and a couple of Angkor Draft beers (50 cents each). Bargain though we forgot to take out enough money so Mike had to run back to the hostel to get some (Mike: again!) Whoops. We then asked the manager if they could sort the shower out which they said they'd called someone who would be there tonight. Waited til gone 11 and no one came. Brilliant. No sleep either as A/C gave up on us too. Not best start in Cambodia. Day started off with us changing rooms. Turns out the manager had no idea who we'd spoken to about the shower, then checked all the rooms on our floor and none of them worked. So we got moved to another Hobbit-sized room - it had really low ceilings and we had to hunch over in the shower to not bang our heads. He headed out for breakfast. As it was after 12 by the time the room issue was sorted, this meant burgers for breakfast :P Our plan for the day was to check out the royal palace and the must-see Silver Pagoda within the palace grounds. On the way we passes a huge temple complex all glittering with gold roof tiles in the sun. This turned out to be Wat Ounalom - monks strolling around, cats sleeping on pagodas - it was a really peaceful place. Onwards we headed to the palace. We knew that as King Norodom had passed away in October that the palace was closed, but the Silver Pagoda was still accessible, so we wandered around the entire surrounding walls to find it. No such luck. Plus it was boiling hot and we were both feeling a bit woozy so we headed for the National Museum. Inside they had lots of pottery and stonework from the Angkorian era and lots of relics taken from Angkor as well. At this point Mike was really struggling with the heat so we stopped off for a drink then made our way home. On the way we walked back past the palace and gathered outside on the grass were hundreds of Buddhist monks all dressed in orange, waiting to pay their respects to the late King. Pretty cool to see. Once home realised Mike was not feeling any better so after a nap I headed out to eat. Have to say it was strange after all that time together to be heading out alone in a strange city. Made me realise how lucky I am to be travelling with Mike. Still the food was pretty good and I got a cheeky glass of wine to have with my Thai green curry. Lush :P Got back and Mike was in a pretty poor state, fever and all, so we barely slept again that night, poor thing. Late start but Mike decided he was feeling up to a day out today. Found ourselves a tuk tuk to take us to the Killing Fields and S21 (the prison/ torture camp set up during Pol Pots regime). We went to the Killing Fields first and grabbed some audio-guides. The place was eerily quite and really moving. Once in the grounds, there was one large monument in the middle, and dozens of mass graves, some with a little roof covering them, which you walk between on the paths whilst listening to the horrendous stories of the Regime and what happened here. There was a spot which I found most upsetting - The Killing Tree. This is where they took children and smashed their heads against the tree. They said that in order to wipe our the weeds, it's important to take out the roots first. Next to the tree there was a pit where they had found children's bones, and brain matter on the tree. They say sometimes in the heavy rains, fragments of bone and teeth wash up from the graves and surface. You could just make out where some of these were. We ended the tour at the monument in the centre. In here was housed hundreds of skulls, all in rows looking outwards through the glass walls. It's hard to imagine that these people were all killed little over 30 years ago, just for being educated, or just because of the way they looked (glasses or soft hands would also be cause for death) It's hard also to take in that after the atrocities of WW2, the world let this happen, and that the United Nations even acknowledged Pol Pot as the leader of Cambodia during this time. Of all the places we've been to on this trip, here and the War Remnants museum in Saigon have had the most affect on me I would say. Afterwards, we headed back into town to S21. This was a school before the Khmer Rouge turned it into their torture prison. The classrooms either had beds in them with chains and torture implements, or they had wooden cells made into them about 5.5ft by 2ft so that the prisoners couldn't even lie down straight. Other rooms contained the photos of every soul that had come through the place. Only 7 people made it out alive. There were stories of some children who were taken there with their mother, then separated, and were found by the Vietnamese soldiers when they took over the place. Their mother didn't survive though. Others who survived only did so as they managed to be of use to the Khmer Rouge as painters, mechanics and such. It was really hard to take it all in, and also the fact most of those responsible have never been to trial. Pol Pot was put under house arrest only and lived with his family until he was poisoned at 80 years old. Places like this make you realise just how lucky we have it. After this full on day, we booked our bus tickets to Sihanoukville, had food then watched the original Conan film - not exactly what I would watch to unwind from a busy day, but appeared Mike was on the mend after some Arnie time.